Well, will they get away with it? 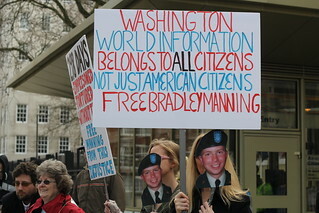 The unlawful punishment of Bradley Manning. It’s two and a half years today since Bradley Manning, the 24 year old US soldier who, less than a decade ago was a schoolboy in Wales, was taken into custody in Kuwait, accused of releasing ‘Collateral Murder’, that chilling video, into the public domain. 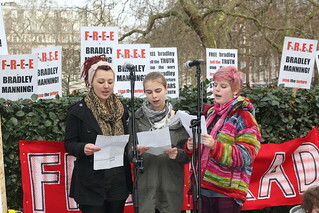 The notion of a ‘speedy trial’ – every US soldier’s right under the legal guidelines for Courts Martial – seems to have been dismissed by the prosecution (the US Government) as an unwarranted luxury, not for the likes of whistleblowers, not for those who feel honour bound to uncover the eyes of others, especially not for Brad, who they went on to charge with the leaking of the most extensive cache of documents ever, and with whom they are plainly very angry indeed. 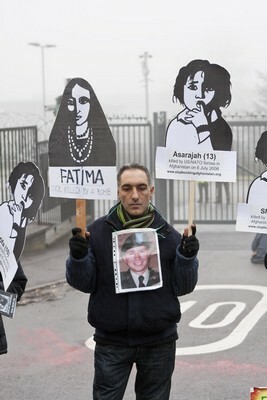 As well as the Apache video (which wasn’t even classified, just embarrassing), he was charged with leaking The Afghan War Diary, The Iraq War Logs, The Guantanamo Files, The State Dept Cables and The Granai Massacre video, for which revelations all who care about the pursuit of peace and justice in this world are much in his debt. a capital offence for which he could be sentenced to life imprisonment without parole. And this is for what even a willfully stupid person could see is an ‘act of conscience’. Have a look at this if you are in any doubt. not even because we didn’t believe it could happen, but because it was just so blatant, because they didn’t seem to care that people knew, and because they really seemed to think they would get away with it. Although there are supposed to be no more than 120 days from being taken into custody to ‘arraignment’ (the formal start of the Court Martial process), Brad was held for 635 days before he was finally arraigned on 23rd Feb 2012. 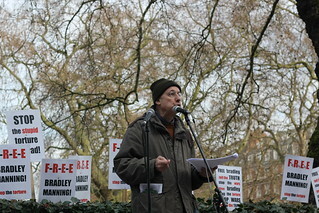 About this abuse of process, David Coombs, Bradley’s lawyer, has complained that, not only have the prosecution no good reason for requesting most of the delays, but the convening authority (who can give permission for delays which then won’t ‘count’ towards the 120), were extraordinary lax in regulating the delays. And that even the delays that the defence had to request were made necessary solely by the prosecution’s unacceptably slow production of evidence – ‘discovery’. On the basis of this denial of Bradley’s rights to a ‘speedy trial’, the defence therefore filed a motion on 19th September to dismiss all charges. And at the last hearing on 7th and 8th November, we heard the testimony of those who authorised these delays as they took the stand for the prosecution opposing this motion, and were cross questioned by the defence. The defence case to dismiss for lack of a speedy trial will now be presented to the court at a hearing between 10th and 14th December. Meanwhile, Bradley has submitted to the judge an offer to admit to certain ‘lesser included charges’ and this is being considered by her; as well as this, he has elected to be tried by Judge Lind alone (instead of a ‘panel’, jury). 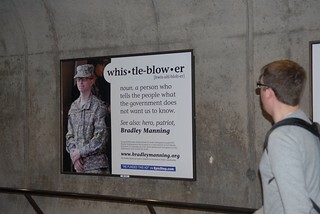 Jeff Paterson points out the ‘whistleblowing’ place we have arrived at with this offered plea in his post on the Bradley Manning Support Network: ‘Analysis: Bradley Manning accepts responsibility for an act of conscience’. Well worth reading in full. 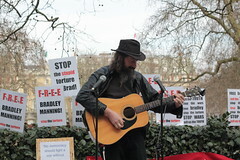 Few of us would have predicted, when we came together at the US Embassy in March 2011 to demonstrate against the torture of Bradley Manning, that we would not even have arrived at his trial 18 months later. Few of us would have predicted that we would have to wait until now to hear the illegal pretrial punishment that we were protesting challenged in court. 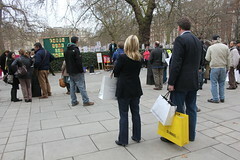 And few of us would have believed it would still be necessary for people to gather at the US Embassy on Tuesday 27th November 2012 at 2.00 pm to stand in solidarity with Brad again as the audio track of Collateral Murder plays and whilst Brad is in court in Fort Meade presenting evidence in defence of the motion to dismiss charges in respect of the ‘illegal pretrial punishment’ he was subjected to at Quantico. Apart from being held in solitary confinement (the effect of the ‘Prevention of Injury’ status which they kept Brad under most of the time, breaking with this only for the even more restrictive ‘Suicide Watch’) in a 6’ x 8’ cell which, just once a day, he left (walking in leg irons and shackled at his hands) for an hour’s ‘recreation’ in another room in which he was able to do little more than walk a figure of eight for the duration, Brad was also not permitted any form of exercise whatsoever in his cell; was severely restricted as to when and how he could access books or writing materials; was not allowed any personal possessions in his cell, and, being unable to access the internet, remained substantially cut off from news from the outside world other than that which he received from letters or occasional ‘non contact’, recorded, visits. In a nightmare scenario reminiscent of the drip drip of water torture, he was also forced to respond every five minutes to the guards asking him if he was OK. At night he had to surrender his clothes other than his underwear to the guards, was denied a pillow or sheet – meaning he had to sleep under a rough blanket which caused chafing – and if the guards could not see his face at all times, they would wake him up – ostensibly to make sure he was alright – and again he would have to respond affirmatively before they would leave him to go back to sleep. Brad was held under Maximum Security Status, and he was the only prisoner at Quantico Brig with this status. He is not going to receive special privileges, which is essentially what you are asking him to receive. He is being treated exactly like everyone else in the brig is being treated. That’s what’s appropriate. We treat them all equally. And I don’t understand why there would be a need for an exception to those rules to be made for Private Manning — or anyone else, for that matter. ah, so that’s all right then…. 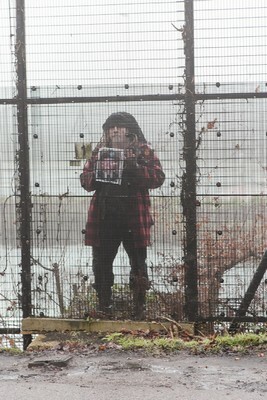 ‘Every other detainee is allowed outside of their cell for the majority of the day. The facility is not locked down when they are walking in the brig. They do not wear hand and leg restraints outside of their cell. They are not escorted by guards when outside of their cell. Every other detainee is assigned to work details during the day. These work details allow them move freely within the facility and also outside of the facility whenever within the security perimeter. There were two periods when Brad was humiliated beyond the regular POI and Maximum Security status by being stripped, on the pretext that he was a suicide risk. 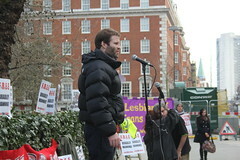 Once was on 18th January 2011, when, seemingly in response to an informal demo at the gates of the Brig, he was bullied by the guards, abused by James Averhart, the Brig Commander, and then stripped, deprived of his prescription glasses, and forced to remain naked in his cell without being able to see, for 48 hours on ‘Suicide Watch’. 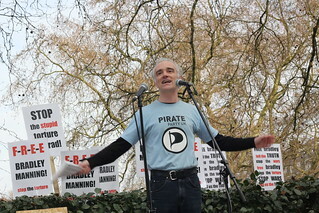 This episode was explained in a letter that was released on Coombs’ 10th March 2011 blog while we were planning the 20th March protests, and we decided to end the protest by hearing it as it is from Brad – and ‘giving him the mic’. Read it – it’s shocking. 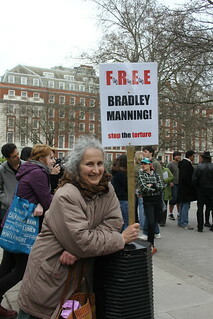 The other episode was presided over by Denise Barnes, and was the last straw for the Quantico regime, the real ‘shooting themselves in the foot’, for when, between 2nd March 2011 and the 6th March 2011, she ordered that Bradley be stripped naked at night, have all his clothes removed from his cell, and (this is what really did it) stand naked for roll call, the whole world erupted! And ultimately this is what got Bradley moved. We were astounded the next night that, although the Brig knew Coombs was ‘telling the world’ about it, the Brig still said that this would continue ‘indefinitely’, and seemed unconcerned about anyone’s reaction. ‘On Wednesday March 2, 2011, PFC Manning was told that his Article 138 complaint requesting that he be removed from Maximum custody and Prevention of Injury (POI) Watch had been denied by the Quantico commander, Colonel Daniel J. Choike……. and this from a young person who had been subjected to abuse, bullied and isolated and, not only that, had just learned that the charges against him had now had ‘aiding the enemy’ added to them – a charge which can carry the death penalty. Pretty amazing! and that’s why, we learned, he had been stripped at night and forced to stand naked at roll call except…. 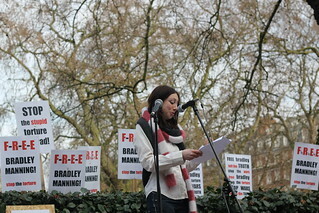 In response to all this, and especially to, unbelievably, the Brig stating that this ‘being stripped and made to stand naked’ was ‘set to continue indefinitely’ the International Support Network www.bradleymanning.org called for worldwide protests to take place on 20th March 2011 and we began to plan our US Embassy demo. On 7th March, the Brig made the concession of giving Brad a suicide ‘smock’ and from then until he left Quantico, he was forced to wear this at night. So how did this acute abuse, end? beginning here with the earliest I can find – Ciaron and his fellow Catholic Worker, both wearing photos of Brad in solidarity at the 29th Dec 2010 (Holy Innocents) Northwood HQ Anti War demo and reported in the Northwood and Uxbridge Gazette…..
the protest from 295 top lawyers (including Obama’s own professor, Laurence Tribe) who signed an open letter to the administration: ‘A Statement on Private Manning’s Detention’. and on being asked if he was ‘on the record’ thought for a second when there was ‘an uncomfortable pause’ and then obviously decided to ‘go for it’ and said ‘Sure’. 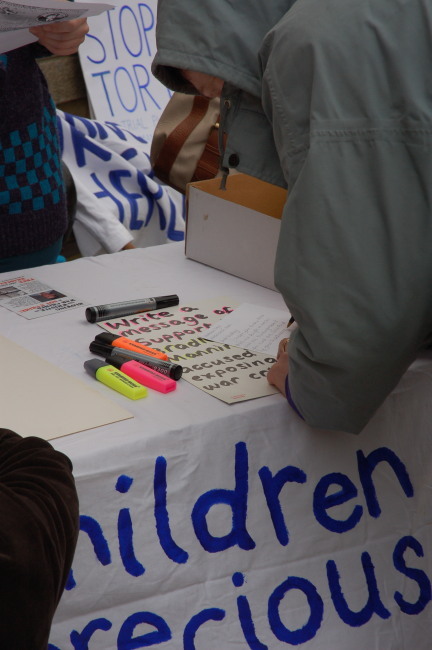 and then of course was inevitably ‘resigned’ by the State Dept two days later…..
All change! And as David Coombs said….this taken alone proved that the treatment meted out to Brad at Quantico was totally without justification. 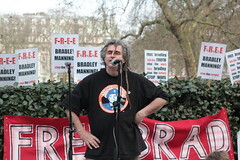 The conditions of Bradley’s imprisonment under the ‘POI’ ‘Maximum Security regime have been listed in more detail by David Coombs here in a summary of the motion he filed on 10th August 2012. New information has emerged such as Brad not being permitted soap with which to wash his hands – he had to ask for it every time he needed it; he had to ask for toilet roll every time he needed it and (it goes without saying) had to often wait on the guards for these things. This is the motion which will be argued in this next hearing – 27th November to 2nd December. This same blog post also touches on the discovery we made in July that the regime Bradley was being held under could be ‘traced up the chain of command to a three star general ‘ something which will obviously be ‘coming up’ in court! 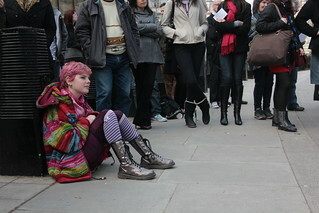 And it deals with the two occasions when Bradley restrictive status was actually increased and he was stripped as well. So it’s a good one to read. The defence has obtained permission from the judge to have one of the suicide mattresses Brad had to sleep on actually in court for this motion , and also one of the coarse suicide ‘smocks’, which, in response to the public outcry at his being made to strip at night and stand naked at roll call, they gave him to wear in bed (it was too large, hideously uncomfortable and also nearly strangled him one night when it got caught round his neck). Well the judge wanted to see for herself just what they’re both like. And probably the most riveting thing to anticipate is the likelihood of Brad himself taking the stand sometime in the middle of the week. 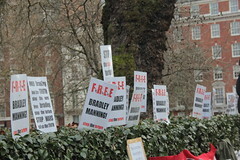 There apparently is a ‘missing’ video – Bradley has insisted they videoed a specific sequence in one of the ‘stripping’ times, and the defence has sought ‘discovery’ of this from the prosecution, but, surprise, surprise, the prosecution do not recognise the existence of any video other than the ones they have already handed over. In the discussion regarding this in court, Coombs alluded to the fact that Brad would go into the witness box to testify as to it’s existence. Presumably, that’s what will happen? We’ ll have to see. 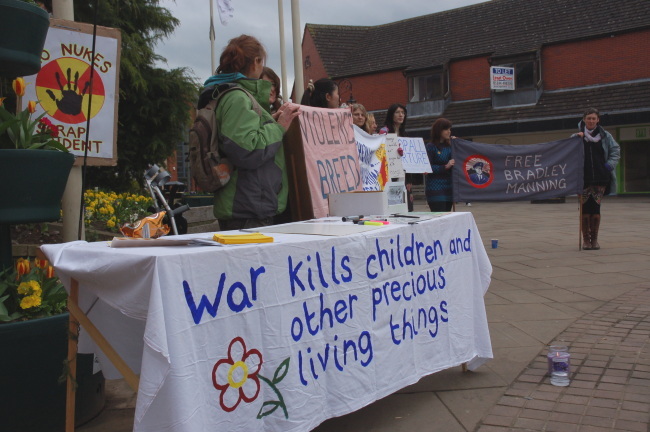 Gallery | This entry was posted in Announcements, Manning, Reports and tagged anti-militarism, anti-war, asylum, Britain, Catholic Worker, demo, Ecuador, Ecuadorian Embassy, extradition, Julian Assange, London, solidarity, Veterans for Peace, vigil, WikiLeaks, WISE Up. Bookmark the permalink. 4 Responses to Well, will they get away with it? 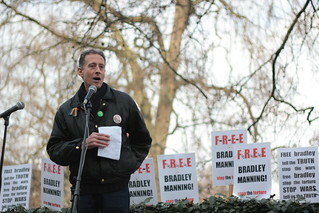 The unlawful punishment of Bradley Manning. It is not to imagine what you have experienced. You have brought a very big sacrifice for humanity and human rights! Is justice for you above everything, I am very grateful to you and find you a very brave man!! I wish you strength to continue and hope ther will soon be Justice for you! !